Sixty years had passed since the rending of the nation of Israel into two quarreling kingdoms. The ten tribes wrestled with the instabilities of a succession of kings, three of whom died by violence, while Judah enjoyed few dynastic changes. Sticking with the Davidic line afforded a sense of continuity. Israel struggled with confusion caused by adulterating their religion with paganism; Judah adhered to the precepts handed down since Abraham and Moses. Israel not only had internal turmoil, threats loomed from outside its borders—especially from the Aramean kingdom of Damascus. 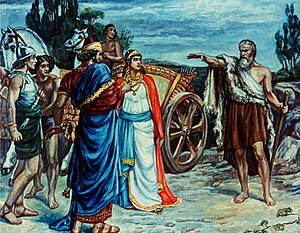 Omri, Israel’s sixth king, attempted to seal alliances with neighboring Tyre, by arranging a marriage between his son Ahab and Jezebel, the Tyrean king’s daughter (Bright, 238). Who was this woman Jezebel? Jezebel was a royal princess. She was probably well educated and efficient. Jezebel was no doubt the chief wife and co-ruler with Ahab. She might have acted as her husband’s deputy for internal affairs. She had her own prophets, or possibly controlled a pagan religious establishment. She was the enemy of Yahweh’s prophets and had them killed (I Kings 18:13). She was not shy to take the lead and exert her power. All sources agree Jezebel was totally immersed in the culture of Baal worship and had a zealot’s zeal to spread it throughout her new kingdom. The united tribes were historically drawn to paganism. Now Jezebel planned to make the cult of Baal the official religion of the court. Israel’s penchant for inclusivism paved the way for her evil efforts. The Lord God had other plans.